It’s about time! It is highly encouraging to see more and more businesses donating their unsold food to charities that are feeding the hungry. The Olive Garden and Chipotle have been donating food for some time, and now, Starbucks has announced a plan to donate 100 percent of its unsold food to food banks. This is truly heartening, because, according to the documentary Just Eat It, about 40 percent of the food grown and raised in the United States goes into the trash, or is thrown out as compost. Considering that millions of people living in this country and around the world are hungry, throwing out perfectly edible food is just inexcusable. Starbucks will be donating all of its unsold food through a new program known as FoodShare, and all 7,600 Starbucks stores in the United States will be participating. The food items will be given to Feeding America and the Food Donation Connection. The meals will then be transported to food banks, where hungry families and individuals can receive them. To make sure the food reaches food banks unspoiled, it will be transported in refrigerated vans. Starbucks is aiming to reach 100 percent unused food donation by the year 2021, and by the end of this year, the company says that five million meals will be given to food banks. In the United Kingdom, efforts are also underway to get unsold food to the people who need it. Tesco, the biggest grocery chain in the UK, has enacted a 14-store pilot project known as the Community Food Connection, in order to get unsold food to 5,000 charities. Through the use of a digital open platform known as FareShare FoodCloud, store employees and charities will be able to interact so that food can get where it needs to go. During the pilot, Tesco locations in 15 cities will be participating, and by 2017, all locations are to be involved. As far as national food donation initiatives, Italy has joined France in enacting legislation to encourage grocery stores to donate their unsold food. In France, grocers are now fined for throwing away food. In Italy, grocers will be rewarded for donating it. If passed, the bill will allow grocery stores that donate their unsold food to save more money on taxes. The more they donate, the more they will save. The bill will also make it easier for donations to be made, by no longer requiring food donations to be declared in advance. On top of that, government initiatives are being put into place in Italy to encourage the use of doggy bags at restaurants so leftovers are not wasted. It is truly wonderful that these companies, and countries, are taking action to not only prevent food from ending up in landfills, but also to feed the people who need it the most. If every grocery store and restaurant in America, and across the world, donated its unsold food to the hungry, millions of lives could be vastly improved, or even saved. Previous articleCould Grains Be Behind Your Chronic Pain? 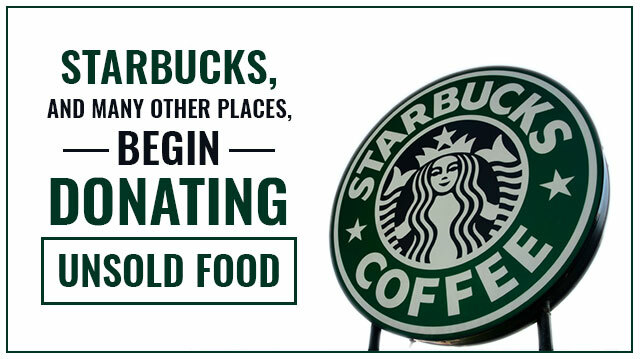 Hey Buddy!, I found this information for you: "Starbucks, And Many Other Places, Begin Donating Unsold Food". Here is the website link: https://www.thealternativedaily.com/starbucks-donating-unsold-food/. Thank you.